If my saved contest log files are anything to go by, this is the first Oceania DX contest I have participated in since 2008. I’ve been looking forward to this contest now, as it is one of the “big ones” for the year, and a big opportunity to obtain some new DX countries. It guarantees me a eQSL eDX award as well as more uniques DXCC. It also means I really need to get around to getting some real QSL Cards printed (Do people have suggestions?). 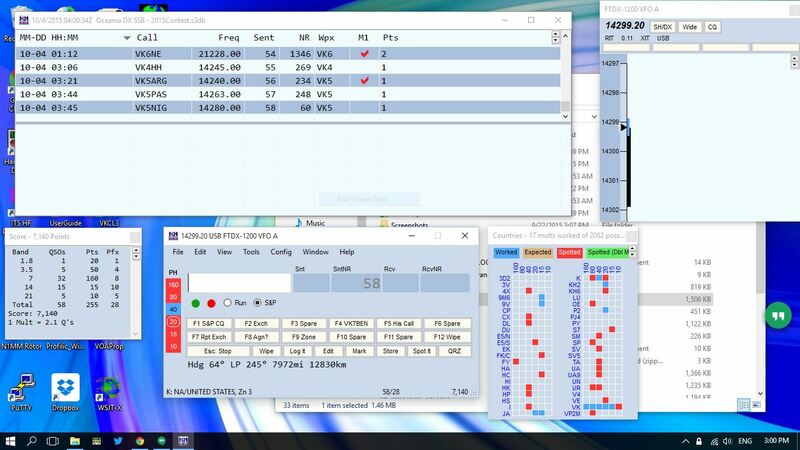 It made for a bit of a busy weekend, as most of Saturday was spent cruising around Hobart, getting home in the afternoon an then settling down to contest in the evening (0800 UTC = 6pm AEST). I decided to use the N1MM+ Logger for the contest. I have used it before in the Penstock Lagoon RD Contest, where it worked well but was largely hampered by not having a definition file for the RD Contest. N1MM+ does know about the big contests though and I was keen to get hands on with it again. The contest started off a little slowly on 40m, with my first contact being VK2BFC just after the contest start at 0801. For most of this contest I operated in search and pounce and went up to the higher bands of 20 and 15m for around half an hour before come back down to the lower bands of 40m and 80m. Most of my evening contacts on 40m were from the local VK/ZL zone, but the one stand out contact here was a US call, K3ZO. Other big highlights for the evening for me included working Japan, Guam and Papua New Guinea, all of which were on 20m. It was surprising how long 20m stayed viable into the evening. My antenna being a trapped dipole is meant to have a range of 5Mhz 30Mhz. I’ve found it’s not terrible on 80m, but does require help from the rig’s internal ATU. It definitely can’t do 160m…until I went and found my trusty MFJ-949E and put that in-line. The MFJ can match the dipole to 160m, and I soon was working Vk5ARG for top band points. I wish I had thought about that for the RD Contest the other month. I’m not that good at staying up all night any more so bedtime happened for me around 11.00pm AEST. After a good sleep I started operating again at 2325UTC and was pleased to find the 15m band was open and people were on it! This is something rather rare for me, so I took great pleasure in working Singapore, Malaysia and Indonesia before a series of solar events caused a radio blackout for me for a good 3 hours. By this point I was around 7000 points up, with only 4 hours to go. I had set myself a personal goal to achieve 10,000 points and given I had only managed 2000 points for the day so far, with just over 5000 made the night before, I was beginning to think that I wasn’t going to make it. Thankfully the 20m band opened to Europe and a quick succession of contacts to Russia, Croatia and Germany put me over the top. From there it was just a nice downhill run to the end of the event, and I chose to finish up at the slightly earlier time of 0730 UTC Sunday. I think that this has been a good warm up for CQWW SSB which is in a couple of weeks time. Now all that’s left to do is submit my logs to the contest, to eQSL and to LotW. Catch you all in a couple of weeks for CQWW SSB!